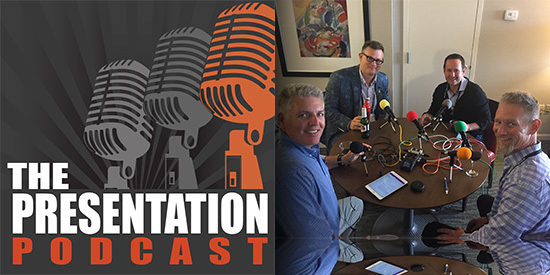 The Presentation Podcast Episode #42 Released Today! A new episode of The Presentation Podcast with Troy, Nolan, and Sandy is available today! Check out the latest episode, #42 – A Conversation With Tom Howell & Mike Parkinson. Enjoy listening to an amazing conversation with Tom Howell of Synapsis Creative, Mike Parkinson of Billion Dollar Graphics, Nolan Haims of Nolan Haims Creative and Troy Chollar of TLC Creative Services. Recorded at the 2017 Presentation Summit, our conversation covers a range of topics from design projects to studio policies to whether our university degree applies to our career, and so much more! The Presentation Podcast Episode #45 Released Today!